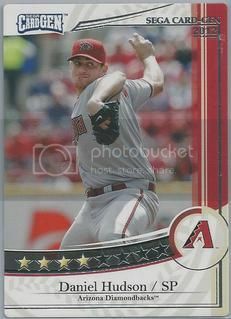 A few weeks ago Daniel from It's Like Having My Own Card Shop picked up a few Diamondbacks cards from the 2013 Topps Museum Collection set. I really liked the Wade Miley certified autograph so I got one for myself. It's a nice on card auto and is numbered to 399. In an effort to try to spend less money on cards, I really haven't been buying many packs since Series One hit the shelves. 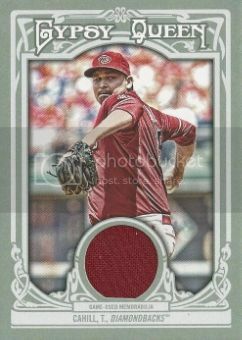 Instead I've been trying to use my money more wisely by picking up some Diamondbacks inserts that I like. I've also been saving for San Diego Comic Con which starts today. It's my first time going so I'm not really sure what to expect. I'm one of those people who is going more for the Hollywood aspect than the comic books. Hopefully I come home with some cool stuff and maybe a celebrity autograph or two. 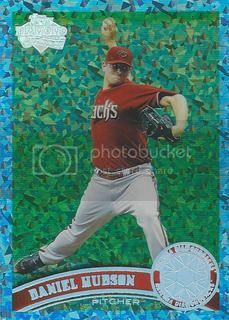 This Trevor Cahill jersey card from the 2013 Topps Gypsy Queen set came to our D-Backs collection for less than the price of a pack. I like the red swatch. It goes well with the photo and GQ design. Oh the glory that was Topps Pristine. I've been a fan of these cards since I was busting an uncirculated Scott Hairston rookie card out of its case to get autographed. 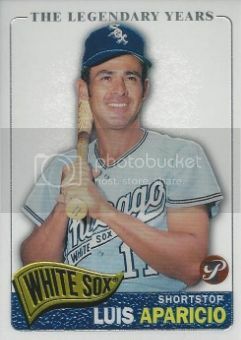 Now I have this wonderful Luis Aparico card that looks like a Chromed out 1965 Topps card. Awesome! The Topps Heritage sets always offer up some nice relic cards through their annual Clubhouse Collection insert sets. This year's was no exception. I didn't buy enough packs of the 2013 set to pull anything good myself. 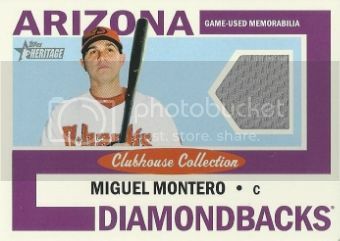 However, I was able to buy this Miguel Montero relic on the secondary market for less than the price of a pack. 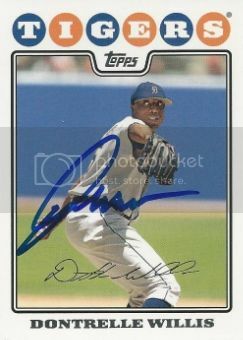 A friend on SCN helped us out with this 2008 Topps card signed by Dontrelle Willis. Dontrelle's career started off magnificently. 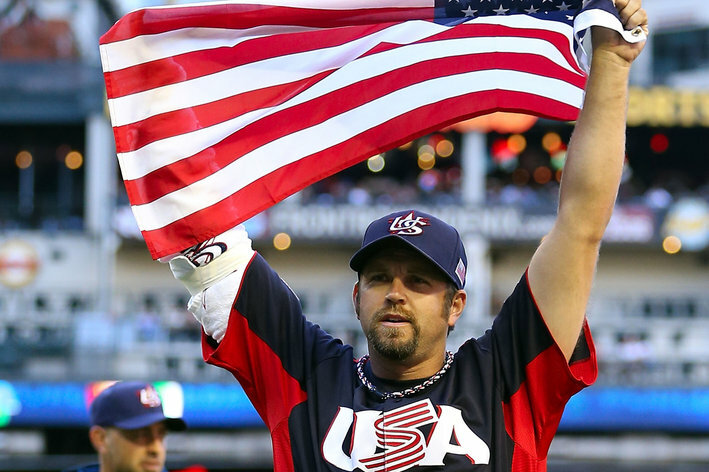 In 2003, he won the National League Rookie of the Year award while leading the Florida Marlins to a World Series Championship. Since then he's bounced around from team to team (including a short stint with the Arizona Diamondbacks). Dontrelle is currently playing for the Long Island Ducks of the independent Atlantic League. 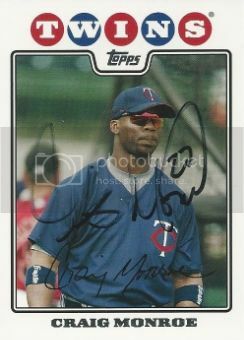 Former Minnesota Twins outfielder, Craig Monroe signed his card for our 2008 Topps set. Craig is probably best remembered for his time with the Detroit Tigers. He put up some pretty big numbers for the Tigers in 2006. He hit 28 home runs and drove in 92. We took a road trip to California this week. The best part of our vacation so far has been being able to take my son to his first game at Dodger Stadium. It's the fifth stadium he's been to and he hasn't even turned five yet. 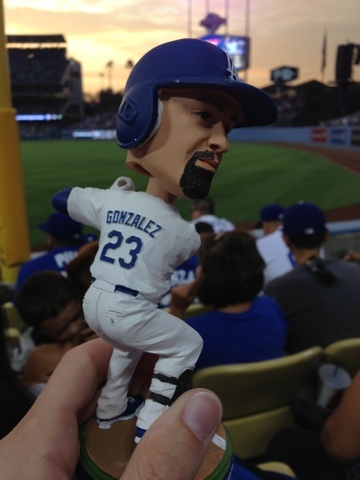 The highlight of the game was that today was Adrian Gonzalez bobblehead night! Unfortunately for the Dodgers won their fifth straight game and are currently a game and a half behind the D-Backs for first place. I've wanted this Luis Aparicio card for a long time and now I have it! No, it's not a fancy relic or a cool autograph. 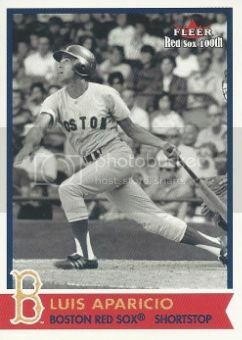 It's a base card from Fleer's 100th Anniversary Boston Red Sox set. My twelve years of patience paid off and I scored this one for less than the price of a stamp shipped. 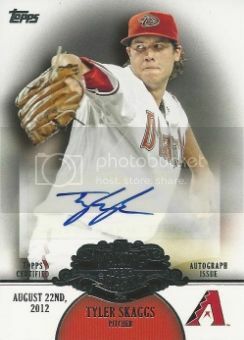 I really like this 2013 Topps Tyler Skaggs Making Their Mark autographed card. Going into the season Tyler was a Top 10 prospect. He struggled a bit in his first few starts with the big club this year but did well this past weekend. My favorite part is that it has the date of Tyler's MLB debut in the lower left corner. I was at that game! Russ Ortiz signed a large free agent contract with the Arizona Diamondbacks after the 2004 season. He was a huge disappointment. After battling a few injuries, the D-Backs released him in May 2005 with over two years remaining on his contract. During his short time in Arizona, Russ had a 5-16 record. Four of those five wins came in his frist six starts. 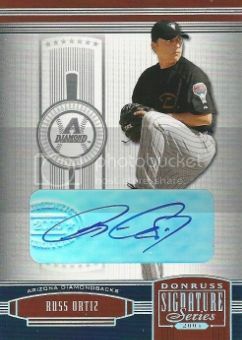 I picked up this 2005 Donruss Signature Series auto for less than $2 shipped. Matt from Once a Cub sent us a great package of Diamondbacks stuff including a few magazines. 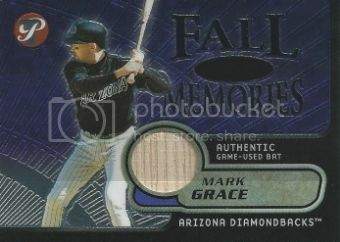 The highlight was this 2002 Topps Pristine Mark Grace bat card. After some legal trouble, Mark is currently serving as the hitting coach for the D-Backs Arizona League team. Thanks for the great stuff, Matt! Last November, Greg from Plaschke, Thy Sweater is Argyle posted the Russell Martin 2011 Topps Hope Diamond Parallel card he picked up. He talked about how cool they looked in person. That very same day, I threw in a best offer on this Daniel Hudson version. The seller accepted and a few days later in was in my hands. It just took me about 8 months to do a post on it. Greg was right these are very nice looking cards. Mine is numbered 44/60 on the back. A few months ago it seemed like everyone in the blogosphere was picking up some of the 2012 Topps Sega Card Gen cards for their collections. I bought this Daniel Hudson one back then but never got it posted. If you haven't heard of these before, they're from some kind of Japanese arcade game. You can watch a video of the gameplay here. This is one of my favorite cards from our Daniel Hudson collection. 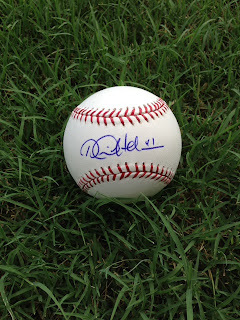 While doing an eBay search last weekend, I came across this Daniel Hudson autographed baseball. I hadn't been looking for a ball specifically, just wasting time and seeing if there was anything new out there. But when I found this it was such a good deal, I couldn't pass it up. For just over $8 shipped, I won this baseball signed by Daniel Hudson. The seller originally bought it at Chase Field during one of the D-Backs Foundation's mystery ball nights. For $40, you get a baseball of a random player in a sealed box. I guess he didn't like Huddy very much so he let it go for less than the cost of a new ball. Not bad since it has an MLB authentication hologram too. 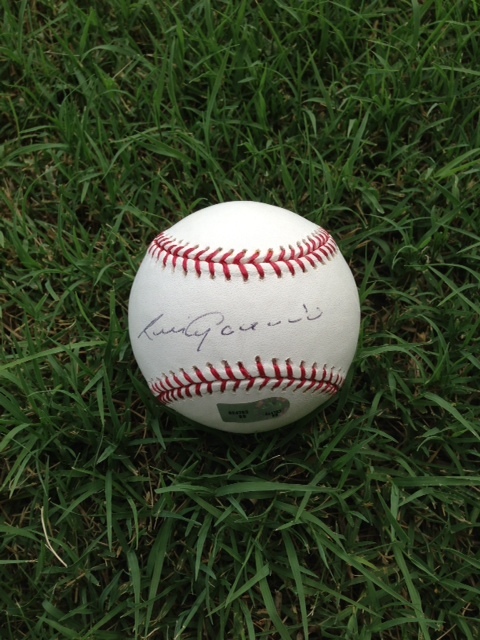 I'm not a huge fan of autographed baseballs but I do have a few dozen. This one goes right to the top of my list of favorites. I figured it was time to pick up a Luis Aparicio autographed baseball. I took my time with this one to make sure I got a good deal. I think I did okay with this ROMLB signed on the sweet spot. The seller got it signed at an All-Star Game Fan Fest so it has an MLB authentication hologram on it too.